For kids who grew up in the late ’60s through the mid-’70s, as the song says, every day was Halloween. That decade’s span saw a strange, relatively short, yet concerted effort to sell monsters—specifically the Universal Studios trio of Frankenstein, Dracula, and the Wolf Man, in all their various forms—directly to children. With the benefit of hindsight, it’s kind of a peculiar idea. As an A.V. Club primer pointed out a few years ago, the 1930s and ’40s saw the definitive versions of these three horror-movie mainstays created in Universal movies designed explicitly to scare people. Of course, even then, they had some sympathetic elements: James Whale’s Frankenstein, its monster personified by Boris Karloff, had a sort of childlike innocence. Bela Lugosi’s gothic version of Bram Stoker’s Dracula came across as a tortured romantic. Lon Chaney Jr. in 1941’s The Wolf Man was a particularly lovelorn werewolf. Still, they were monsters predisposed to murder—even killing small children. Today it would be like making kids’ entertainment out of Michael Myers or the Babadook. The Universal monsters’ transition away from being purely nightmares officially began once they started showing up in comedies, like 1948’s Abbott And Costello Meet Frankenstein. Like the spooky dares, gruesome ghost stories, and other kids’ games like Ghost In The Graveyard and Flashlight Tag, those films created a safe space for scares; Frankenstein’s monster isn’t really going to snap Abbott’s neck, after all. And once Screen Gems purchased the Universal catalog in 1957 and the monsters invaded “Creature Feature” specials on local broadcasts, they soon became a familiar part of the family living room. From there it was just a short jump to the dueling monster sitcom families of The Munsters and The Addams Family, which both aired from 1964 to 1966, which officially reduced these once-terrifying creatures of the night to cuddly characters of primetime. Meanwhile, over on the radio, Bobby Pickett’s 1962 hit “Monster Mash” even made them sound like fun guys to party with. Around the same time, magazines like Famous Monsters Of Filmland began appearing in drugstore racks alongside gruesome comics by EC and Marvel, minting an entire generation of young horror buffs. Those same kids also eagerly snapped up monster model kits from the Aurora Plastics company, which supplemented its usual cars and airplanes by snagging a license to produce Universal Monster sets in 1961. Its very first Frankenstein kit was a runaway bestseller, forcing the company’s plant to churn them out on a 24-hour rotation just to keep up. About a dozen monster kits in all—including Dracula and The Wolf Man, of course—soon followed. That burgeoning children’s market for monsters eventually inspired Jules Rankin and Arthur Bass, who’d already made TV history with 1964’s Rudolph The Red-Nosed Reindeer, to center their next animated holiday special on Halloween. The resulting project, Mad Monster Party?, rendered these previously terrifying characters into fun, wacky, stop-motion dolls based on concept drawings from Mad magazine artist Jack Davis. (Davis’ Dracula is even a clear precursor to Sesame Street’s Count, according to Rankin/Bass historian Rick Goldschmidt.) There was some tie to their actual history in Boris Karloff, who collected $3,500 for two days of work to voice Baron Boris Von Frankenstein. But whatever spookiness Karloff’s presence might have created was more than grated away by Phyllis Diller—who laughed and quipped her way through her role as the Monster’s Mate—as well as the movie’s relentless pileup of truly monstrous puns. In 1972, Rankin and Bass followed up Mad Monster Party? with the traditionally animated The Mad, Mad, Mad Monsters. A prequel of sorts, it finds Baron Von Frankenstein (this time voiced by Bob McFadden) creating a mate for his monster, then throwing a wedding for the gruesome duo at an unlucky hotel. While the springy sound effects are nostalgically appealing, there isn’t enough of a plot to engage viewers, contemporary or modern, for its entire 44-minute runtime. Even among Rankin/Bass diehards, it’s been more or less forgotten. Rankin/Bass’ Festival Of Family Classics also attempted to create a Frosty The Snowman-like canon for Jack O’ Lantern in 1972 by casting him in his very own cartoon. But even compared to an anthropomorphic snow mound who eventually melts to death, right before their eyes, Jack proved a bit too unsettling to be fully embraced by children. Rankin/Bass wasn’t the only animation outfit who was trying to make monsters cuter and cuddlier. Saturday morning cartoons in the ’60s were rife with shows like ABC’s Milton The Monster, starring Bob McFadden (again) as a goofy, Gomer Pyle-like spin on Frankenstein’s creature, as well as Frankenstein Jr. And The Impossibles, a very-’60s mashup about a boy genius, his giant robot Frankenstein’s monster, and a group of superheroes who pose as a Beatles-esque rock band. Beginning in 1963, Famous Studios had also landed a hit with its cartoon showcase for Casper The Friendly Ghost, with the friendly little specter and his witch and devil friends getting up to all kinds of kid-appropriate, supernatural mischief. And from 1969 well into the present day, Scooby-Doo and his gang were running into—and away from—spooks, ghouls, and monsters of all stripes (even if they did usually turn out to be that one weird old guy). Not all of these had the lasting power of a Scooby-Doo, of course. Although fondly remembered for bringing us Fat Albert And The Cosby Kids, Filmation was also notorious for its decidedly low-rent animation, with its canned laughter and many repeated and reused frames, and that recycling also applied to its 1970 foray into the paranormal. Filmation had a hit with The Archie Show, a show that reimagined the Riverdale teens as a bubblegum pop band, which in turn begat the spinoff Sabrina, The Teenage Witch, which then gave us the spin-off of the spin-off that was Groovie Goolies. Another unlikely musical group (the era’s other most pervasive cartoon trend), the Goolies live in a haunted mansion called Horrible Hall. Whatever plots there are derail as quickly as they’re established, as the Goolies mostly existed to throw out a series of puns and groaners, Laugh-In style (“How do you stop a mummy from charging?” “Take away his credit cards!”), that even the youngest viewers might find corny. Voice-over veteran Larry Storch takes on “Drac,” while “Frankie” affects a Boris Karloff impersonation. “Wolfie” is supposed to be some sort of hippie. Weirdest of all, the mummy’s vocals resemble the voice of radio/vaudeville legend Andy Devine. Against all odds and good sense, the Goolies lasted long enough to host their own Saturday morning cartoon anthology, pairing with classic Warner Bros. characters in the 1972 Saturday morning outing Daffy Duck And Porky Pig Meet The Groovie Goolies. The show became an infamous bomb, with the Goolies even managing to bring those beloved characters down. Filmation was also behind 1975’s The Ghost Busters (unrelated to the movie, though Columbia did have to pay Filmation for the name) which found Storch, in the flesh this time, taking on Frankenstein’s monster and Count Dracula with the help of his old F Troop pal Forrest Tucker, as well as a gorilla. This was followed by 1976’s Monster Squad (again, unrelated to the movie), where a pre-Love Boat and pre-Congress Fred Grandy plays a museum curator who discovers that the wax figures of filmdom’s three most famous monsters can come to life, and that they now want to battle evil as a way to atone for their previous misdeeds. 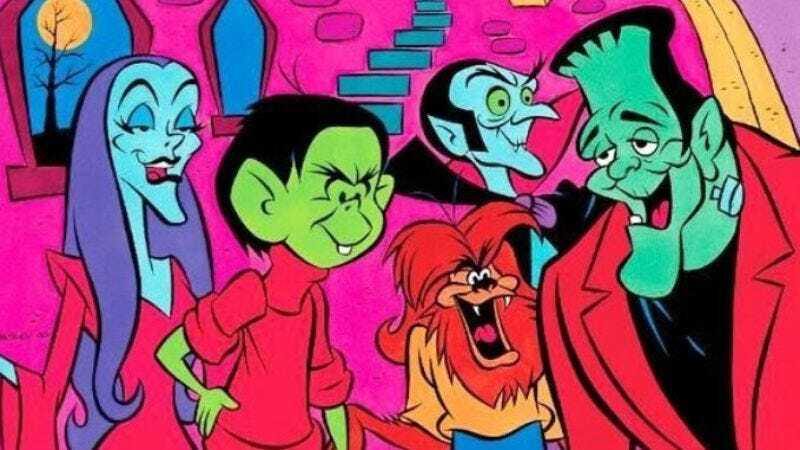 Hanna-Barbera’s 1980 animated cartoon Drak Pack took a similar “monsters as superheroes” bent, pitting the descendants of Dracula, Frankenstein’s monster, and The Wolf Man against the villainous Dr. Dred to right the wrongs of their predecessors. By this point, Dracula et al. weren’t just kid-friendly; they were kids themselves, torn between their genetic legacies and their love of normal human stuff like TV and rock ’n’ roll. It’s a theme that would continue to be explored across shows like NBC’s Gravedale High in 1990 and Fox’s Little Dracula in 1991—none of these lasting more than a season or two, or particularly fondly remembered. But of course, the quality didn’t much matter. Saturday mornings especially held a captive audience of undiscriminating kids glued to their TVs, and they would eagerly snap up whatever monster garbage you wanted to sell them—whether it was cartoons, toys, or even breakfast cereal. In 1971, General Mills got in on the trend with Franken Berry and Count Chocula, kicking off what would become a decades-long marketing juggernaut by reducing the two famous monsters to fighting over who had the better-tasting bowl of “sweeties” (i.e., different-colored marshmallows) in commercials animated by Charlie Brown veteran Bill Melendez. Soon, Franken Berry and Count Chocula were joined by The Wolf Man analogue Fruit Brute, who was eventually rotated out and replaced by the Peter Lorre-mimicking Boo-Berry. Although the monster cereals lost their regular spot in grocery stores in 2010, General Mills now puts Franken Berry, Count Chocula, and Boo-Berry back onto the cereal shelves every fall, just in time for Halloween. While those cereals have stuck around, however, not much else of that original kiddie-monster craze has. It certainly didn’t help that most of these productions seemed to think that merely putting Dracula and the rest into their project was enough, without the need for much thought beyond that. Along the way, those characters weren’t just sanitized—they were hollowed—which is why so few of them are even remembered. After all, the most successful depictions of the Universal Studio trio have always focused on the monsters’ emotional, human anguish beneath their ghastly facade, but their children’s renditions only offered shorthand clichés. Rankin/Bass’ Rudolph remains a classic not just because of its wonderful animation or out of nostalgia, but because everyone can empathize with Rudolph feeling like an outcast. What is there to feel for Mad Monster Party?’s Fang? Decades later, the Hotel Transylvania movies managed to create a more thoughtful, family-friendly version of Universal’s famous monsters by reviving those emotional undercurrents—keeping the old mythology intact, but also portraying Dracula as a modern father who’s afraid of losing his daughter to the realm of humans—and thus demonstrating why so many of its kiddie-monster predecessors failed to connect. After all, those are the kinds of stories—of feeling like an outsider, hounded by a world that doesn’t understand you—that these monsters were created to tell in the first place. And it’s why they continue to resonate with generations young and old, no matter how many cheap, silly mutations they’ve endured.